A short intro to why we use stair landings, and various layouts. Long continuous flights are inconvenient and illegal. Here is a sketch of the side view of an illegal long flight of stairs. Note! for simplicity, what I have drawn in this and the next sketch are just the rise and go triangles, they are not intended to show an actual stair. Landing: A horizontal platform or section at the top or bottom of a flight of stairs. For safety reasons landings are also used to break up otherwise too long flight of stairs or they are used when a change of direction is required. Flight of stairs, Stair flight An unbroken series of steps between landings. Stairway, staircase: A complete set of steps leading from one floor/storey in a building to another. This includes any landings and handrails etc. Stairwell: A space reserved in a multi-storey for the stairways. Above is a sketch of a long flight of stairs. As it stands, to build a flight of stairs like this would be impractical for more than one reason. In Australia and many other countries it is illegal. Our BCA (Building Code of Australia) states that the maximum number of steps in any single flight of stairs is 17. Notice my use of the word step, that is the vertical distance or rise. Count the risers, not the treads. There is always one more riser than treads in any flight. One reason for the limitation is that it is simply very tiring to climb a long flight without a break. Another reason is that in the event of a fall from the top, a shorter fall is less potentially dangerous than a longer one. There are also quite often structural reasons for not making large continuous flights of stairs. Heavier, costlier steel supports may be required. If timber is used for the construction then it may just not be available in the longer lengths required. A common reason for not using a long continuous flight of stairs is of course, lack of room. Again, for example a half space landing may not only make the best use of space for a flight of stairs, but also make the total distance walked less. Notice that in the sketch above I used the term finished top/bottom floor level. This is critical, you must allow for the height of the final floor finishes when calculating the risers. Addition of a couple of stair landings. Stair landings - Same flight of stairs with two landings added. Again, just a sketch of the stair triangles. The main point that I am trying to get across here is that the addition of landings into a flight stairs does not change the the riser heights or the tread widths. In any one stairway or staircase, that is between one floor level and the next all the tread widths, and all the risers must be equal. Think of each landing as just another tread, wider and thicker maybe, but it's finished top is conforms to the same rise as all the others. Once again, note the use of the word finished. Landings can also have carpet or ceramic tiles added that affect the finished height. Quarter space and half space stair landings. Stair landings - a quarter space landing. Stair landings - a half space landing. 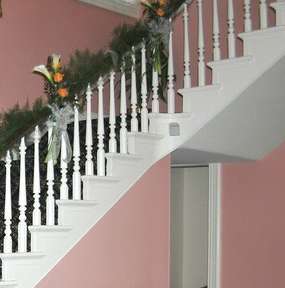 Stair landings - Here's a very nice cut string stair that has a quarter space landing. Note the curved joint to the strings and also the lack of a newel post at the same place. Photo thanks to user Mensatic and Morguefile. The quarter space landing is simply no different to the previous landings all going in the same direction. It has the next flight setting off at a right angle rather than straight on. In some instances two stairs can set off from the same landing, making a stair that is "T" shaped in plan. These are used for architectural effect, but sometimes they have a practical use, such as a common stair that separates to different apartments. More often than not they are the same widths as the stairs to simplify the construction. They should never be less than the width of the stair. Quarter space landings are not as convenient as the half space landing, they are harder get furniture, shopping, etc. around the corner. On the other hand, if room permits and two of them are used, in conjunction with windows they can create an airy and light stair well. 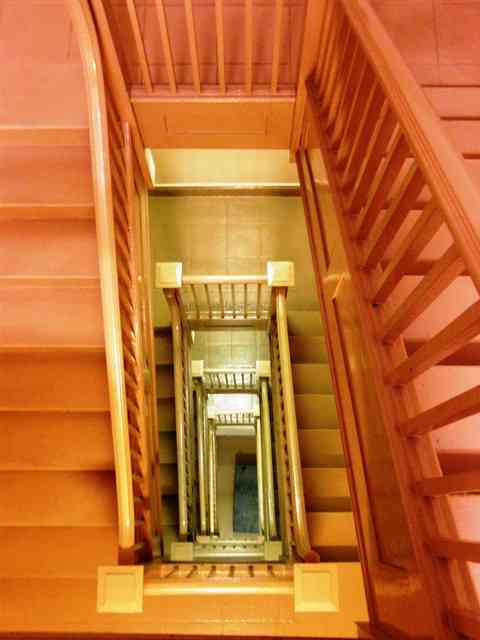 Stair landings - looking down a stairwell. Used here is a half space landing. Note the sweep in the handrails on the top of each flight, up to the higher level section on the landing. Also note the use of ceramic tiles to the landing while the treads are timber. Photo thanks to Kevin Rosseel and Morguefile.